I have a sweet tooth, and it’s not easily satisfied with healthier desserts. I’m working on that. These banana oatmeal chocolate chip cookies are helping. 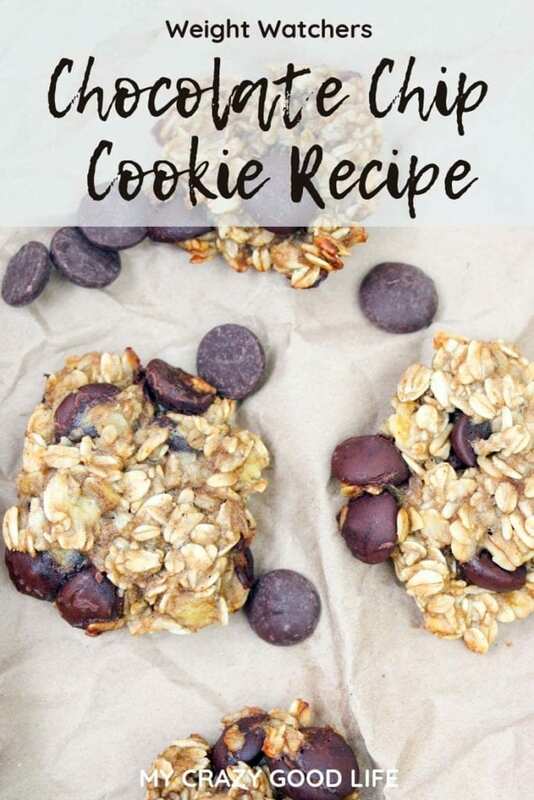 They’re healthy chocolate chip cookies that help you fight cravings for sweets, and they stay well in the fridge! I don’t like banana. Will I like these banana oatmeal chocolate chip cookies? I stumbled upon a recipe for these cookies, tweaked it a little, and love the outcome! 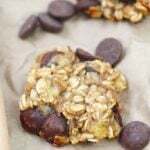 My banana oatmeal chocolate chip cookies are made with bananas, but the taste isn’t too banana-y, and the sweetness level is perfect. I wouldn’t say there’s NO banana flavor but it’s isn’t so prominent that you can’t enjoy these if you aren’t a big fan. There’s a lot of other flavors going on and they’re such a delicious sweet treat I think it’s worth a try! 1. 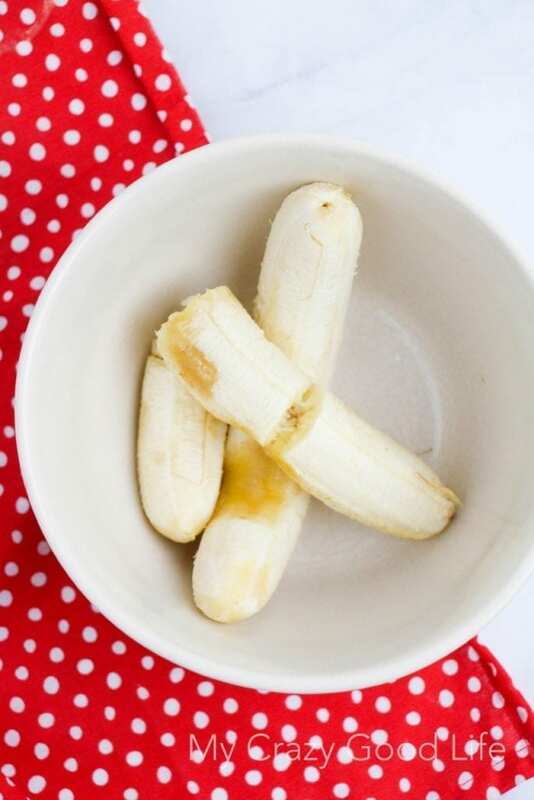 Mash the bananas with a fork. I tried to do them with my mixer, but they didn’t get as mushy as I wanted. The fork works well. 2. 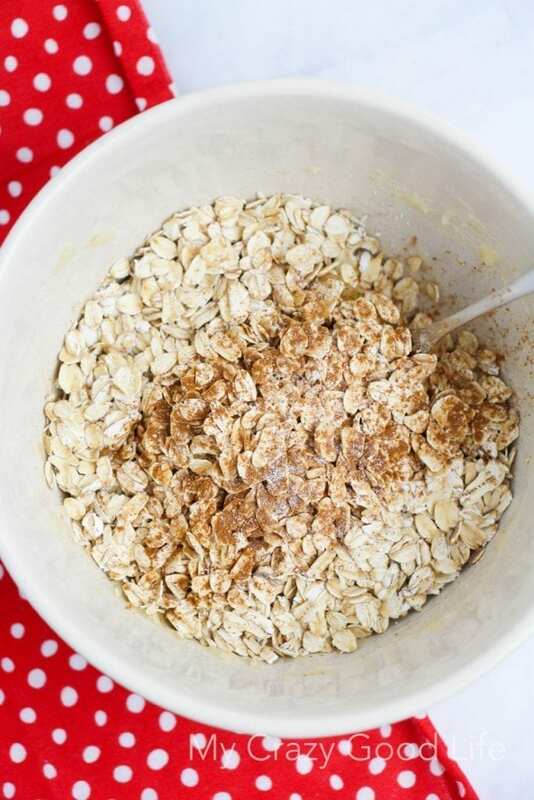 Add everything but the chocolate chips to the bowl and mix for 1 minute. 3. Add chocolate chips and stir by hand. 4. Drop large spoonfuls onto a greased cookie sheet, you should get about 8 cookies per batch. 5. Cook for 18-22 minutes. It’s not easy to tell when they’re done because they’re so dark. I poke them and see if they fall apart. If they start to come apart, give them a few more minutes. 6. Remove and cool, store in the fridge. 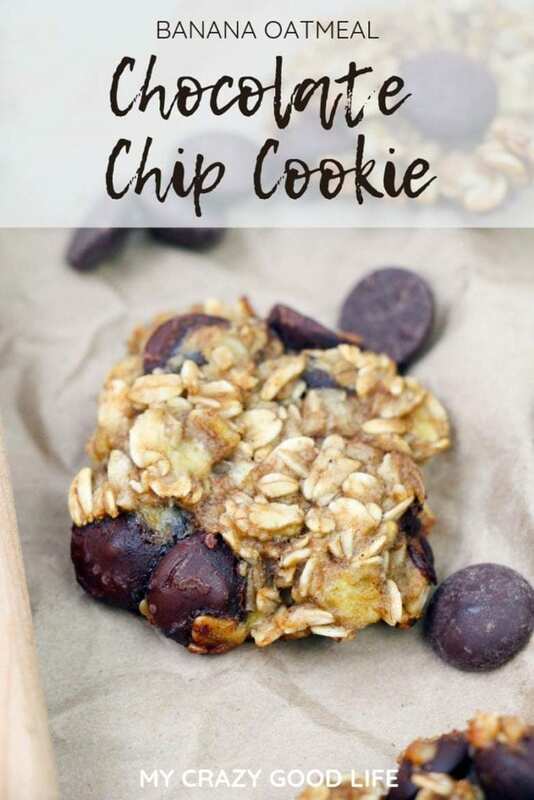 Do you have other recipes like these banana chocolate chip cookies I can try? 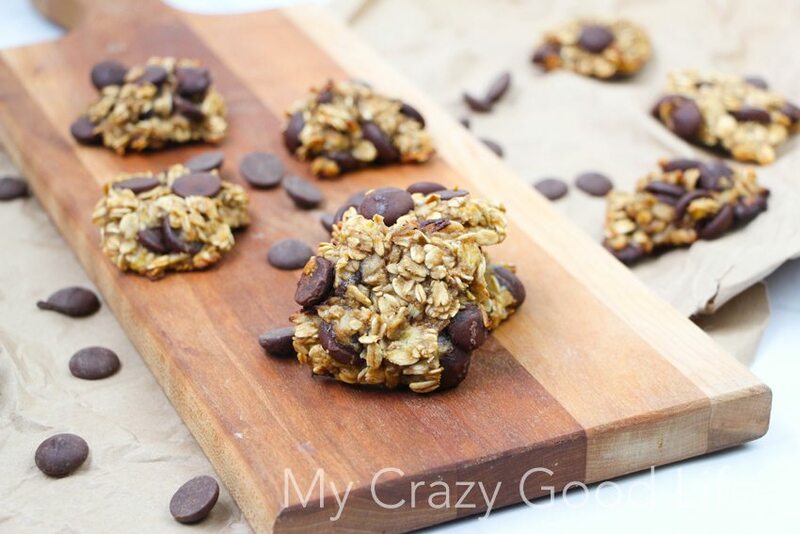 Can I have these healthy oatmeal chocolate chip cookies on 21 Day Fix? These are perfect to eat on the 21 Day Fix if you want to satisfy a craving without sabotaging your diet! If you’re on the 21 Day Fix, these count as a yellow container treat swap. 2 cookies = one yellow container. 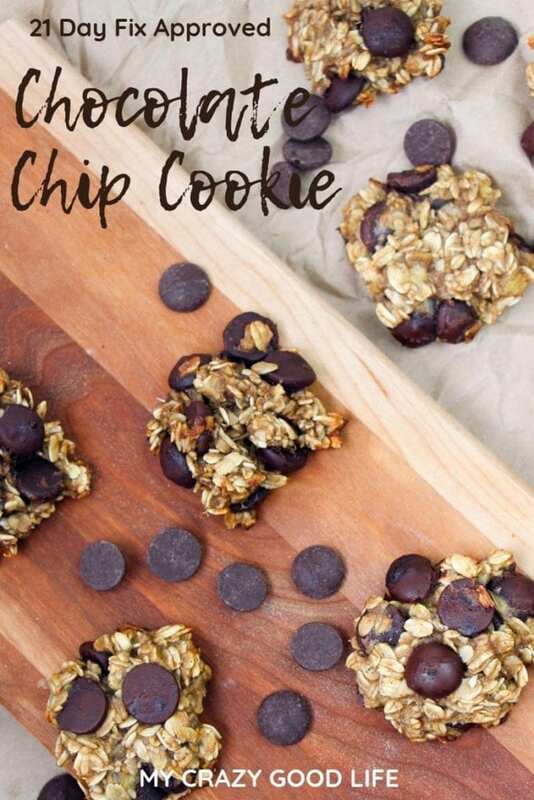 Are these Weight Watchers Chocolate Chip Cookies? 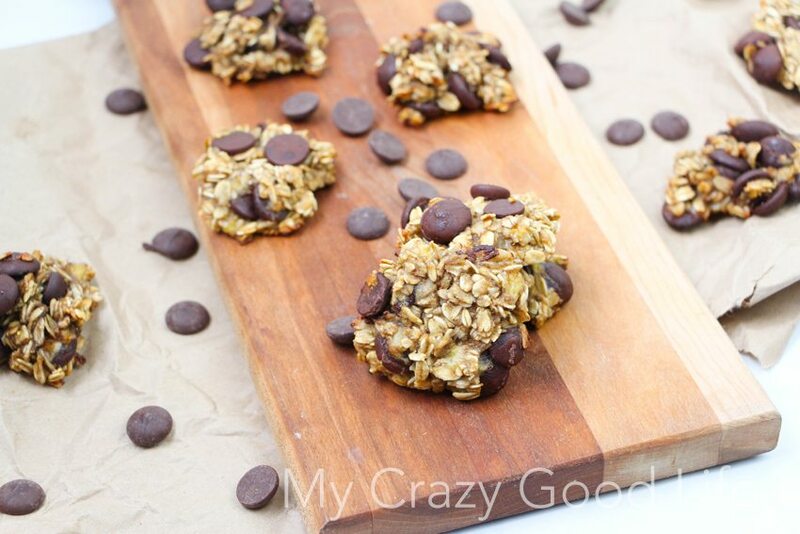 For Weight Watchers, these chocolate chip cookies are 3 points each if you make 8 per batch. If you make them smaller you can adjust accordingly! The entire batch is 25 Smart Points! 1 C oats quick cook or rolled, it didn't seem to matter which I used. Use gluten free oats if needed. Mash the bananas with a fork. I tried to do them with my mixer, but they didn't get as mushy as I wanted. The fork works well. 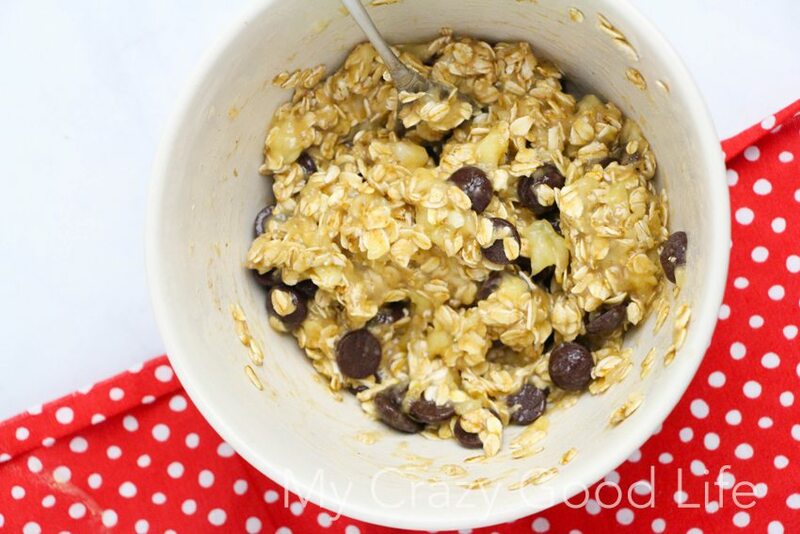 Add everything but the chocolate chips to the bowl and mix for 1 minute. Drop large spoonfuls onto a greased cookie sheet, you should get about 8 cookies per batch. Cook for 18-22 minutes. It's not easy to tell when they're done because they're so dark. I poke them and see if they fall apart. If the start to come apart, give them a few more minutes. Remove and cool, store in the fridge. This counts as a yellow container treat swap. 2 cookies = one yellow container. For Weight Watchers these cookies are 3 points each if you make 8 per batch. If you make them smaller you can adjust accordingly! The entire batch is 25 Smart Points! No change for the Freestyle Smart Points Calculations. Omg, these are so easy and everyone loved them in my office. I added 4tsp of peanut butter-so good! These cookies are amazing!! 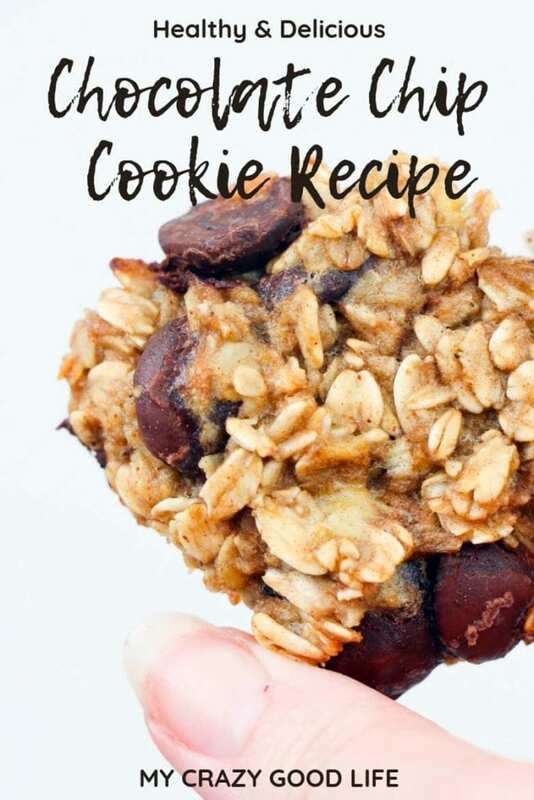 They are so easy to make and they definitely satisfy a sweet tooth craving without being bad for you!! Love them! Just wondering as I’m not a fan of dark chocolate, is there a different chip that can work here? White chocolate? Butterscotch? Or other? Any other chip you want, as long as you’re not on the 21 Day Fix :) For that, it’s dark chocolate only.